By Agnes DeFranco, Ed.D., CHAE; Arlene Ramirez, CHE, CHAE; and Tanya Venegas, MBA, MHM, CHIA. PART II: An analysis of IT spending data in the lodging industry based on reporting in the new USALI Schedule 6 — Information and Telecommunications Systems. 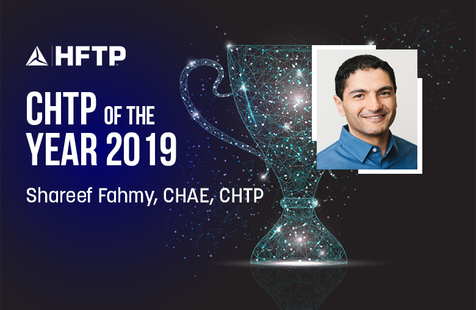 Hospitality Financial and Technology Professionals (HFTP(r)), will honor Shareef Fahmy, CHAE, CHTP as the 2019 Certified Hospitality Technology Professional (CHTP(r)) of the Year recipient during HITEC Minneapolis this June. The CHTP of the Year award honors the individual that scored the highest on the CHTP certification exam within a given year. HITEC Minneapolis will take place June 17-20, 2019 at the Minneapolis Convention Center in Minneapolis, Minnesota USA.Fahmy is the assistant director of finance for the Portola Hotel & Spa in Monterey, California. He was also the recipient of the 2013 Certified Hospitality Accountant Executive (CHAE(r)) of the Year award. Fahmy serves on Global HFTP councils and co-founded the local chapter in Monterey, where he has served as its presidents for two terms and helped the chapter win two Chapter of the Year awards. "I am proud to represent my hotel and HFTP, two organizations that have given so much to me," says Fahmy. "I will continue to do what I can to give back and support the community that has supported me, including promoting HFTP's education and certification programs. "Developed jointly by HFTP and the Educational Institute (EI) of the American Hotel and Lodging Association (AH&LA), the CHTP designation is the ultimate achievement in hospitality information technology by showing a dedication to both the hospitality and technology industries. The CHTP exam was first given in 1994 at HITEC in Dallas, Texas USA. Since then, more than 400 professionals have earned the CHTP designation around the world. 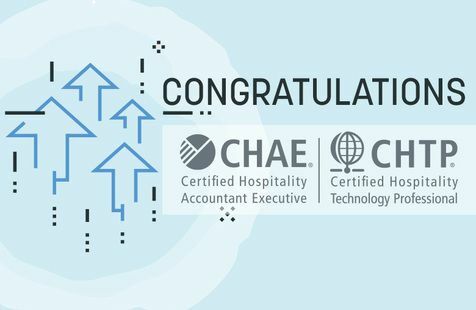 HFTP also administers the examination and awards the Certified Hospitality Accountant Executive (CHAE(r)) industry designation.HFTP's certification programs are globally recognized for setting industry standards for hospitality finance and technology. Qualification for the exams is based on level of education and experience in the industry; student programs are also available. Active certificants have reported higher salaries and various career advancement opportunities. Becoming certified indicates and individual's commitment to professionalism, continuing education and their chosen career path.For more information on HFTP's certification programs, contact HFTP Certification Manager Robin Bogdon at certification@hftp.org or visit www.hftp.org.About HFTP Hospitality Financial and Technology Professionals (HFTP) is a global nonprofit hospitality association, headquartered in Austin, Texas, USA, that uniquely understands the industry's problems. HFTP has members and stakeholders across the globe. HFTP assists its members in finding solutions to industry problems more efficiently than any organization via its expert networks, research, conferences such as HITEC and certification programs. HFTP also owns the world's only hospitality specific search engine, PineappleSearch.com. HFTP is recognized as the spokes group for the finance and technology segment of the hospitality industry. 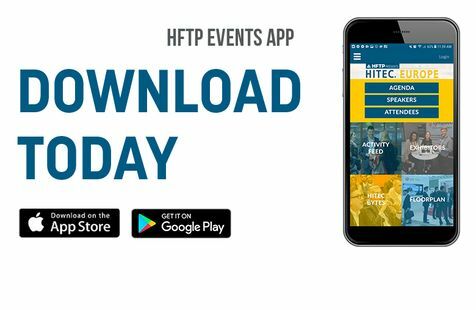 For more information about HFTP, email membership@hftp.org or download the HFTP/HITEC media kit via the HFTP website. HFTP Chief Executive Officer Frank Wolfe, CAE welcomes you to this special evening event, where you can network and learn more about the development of this chapter. 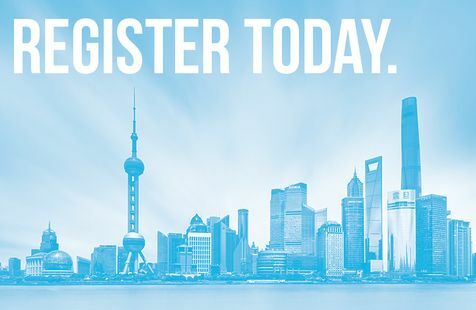 Join other local hospitality professionals on Monday, May 27, 2019 and help start an HFTP China chapter.There has been interest in chartering an HFTP chapter in China. Having a local chapter can help members expand their network, increase their educational opportunities and build strong connections with industry professionals.HFTP China Chapter Charter Interest MeetingJiu Dian Ye Cai Wu Yu Ke Ji Zhuan Ye Ren Shi Xie Hui (HFTP)Zhong Guo Qu Fen Hui Yu Bei Hui Yi Shi Jian :2019Nian 5Yue 27Ri (Xing Qi Yi )Xia Wu :19:00 - 21:30Monday, May 27, 2019Location: Shanghai Marriott Hotel Parkview, Meeting Room 1+2333 Guang Zhong Road West, Jing'an DistrictDi Dian :Shang Hai Bao Hua Mo Hao Jiu Dian ,Hui Yi Shi Yi He Er Shang Hai Jing An Qu Yan Zhong Xi Lu 333Hao To attend, please RSVP. You are invited to the upcoming HFTP Minneapolis/St. 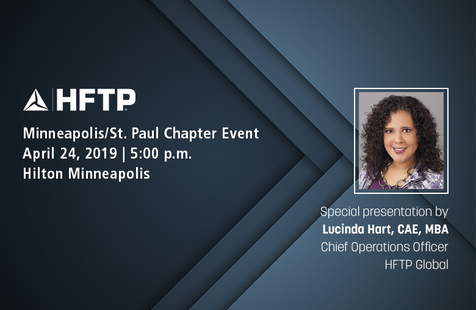 Paul Chapter event to network with HFTP members and other hospitality professionals in attendance.Lucinda Hart, CAE, MBA, HFTP Global Chief Operations Officer, will be presenting the HFTP Global Update. 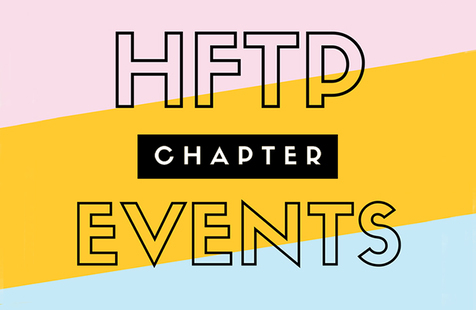 Come learn what is happening around the world with HFTP, the future direction of HFTP, and the intrinsic value the association brings to its members.Chapter Event Details: April 24, 2019 | 5:00 p.m. Hilton Minneapolis 1001 Marquette Avenue | Minneapolis, MN 55403To attend, please send your RSVP. The HFTP Central Coast Chapter will host its April education meeting on the "Cannabis Effect on Hospitality" later this month on Thursday, April 25, 2019. Learn from two experts in the field about the legalization of cannabis and how it affects all aspects of the hospitality, club and golf industry. From workers compensation issues to the handling of guests, come to hear about what you can and cannot do.Victor Xu is an associate for Goldberg Segalla in the firm's Employment and Labor Practice Group. Lisa Peterson is an associate for Goldberg Segalla in the firm's Employment and Labor, General Liability and Retail and Hospitality Practice Groups.Chapter Meeting Details:Thursday, April 25 | 5:00 p.m.Casa Blanca330 State Street | Santa Barbara CA 93101HFTP Central Coast Chapter Members -- $20 (Includes a four course dinner)HFTP Central Coast Prospective Members -- Dinner hosted by the chapterTo attend please send your RSVP. 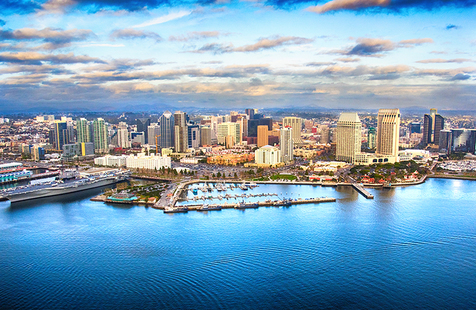 Join local HFTP members and hospitality professionals for networking and education at two meetings being hosted by the HFTP San Diego Chapter this spring.April 2019 Meeting Wednesday, April 24, 2019 * 11:00 a.m. - 1:00 p.m. Andaz San Diego * 600 F Street * San Diego, California USATo attend in April, please send your RSVP.May 2019 Meeting Wednesday, May 22, 2019 * 5:30 - 8:30 p.m. The Lodge at Torrey Pines * 11480 North Torrey Pines Rd. * La Jolla, California USATo attend in May, please send your RSVP. 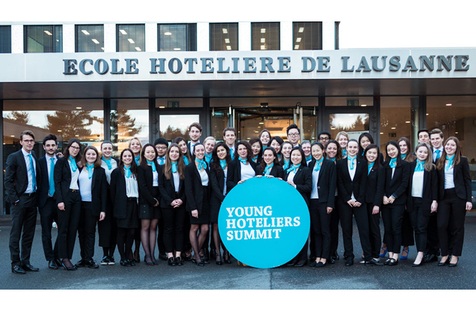 Hospitality Financial and Technology Professionals (HFTP(r)) is proud to partner with the Young Hoteliers Summit (YHS) Global 10th Edition, which will be held March 25-27 at the Ecole hoteliere de Lausanne in Switzerland.Aiming to narrate the hospitality industry's success stories and create a roadmap for future industry leaders, this year's anniversary edition theme is titled: "The Scope of Hospitality: Envisioning -- Defining -- Succeeding." The event will feature five powerful, inspiring keynotes and five insightful panel discussions over three days.Keynote speakers for the 10th Edition include Olivier Bracard, Co-Founder and CEO of Hosco, and Tess Mattisson, Director or European Marketing at Choice Hotels. Panel discussion topics will include "Disrupting Distribution: Game-Changers," "Global Brand Expansion: Adaptation and Development" and "Seizing Top Tech Opportunities: When Data Is Everything. "Meet top professionals from the industry and delegates from more than 40 hospitality management institutions from all around the world.Find out more about the YHS 10th Edition and purchase your ticket. 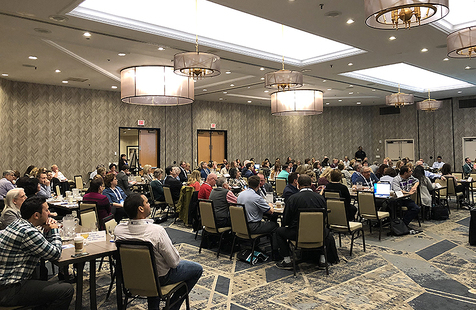 More than 140 club professionals traveled to Nashville, Tennessee last week to attend the second annual HFTP Club Summit. The event was held March 11-12, 2019 at the DoubleTree by Hilton Nashville Downtown. The Club Summit offers two days of advanced-level education specific to the club segment of the hospitality industry addressing strategies, trends and engagement.This year, the educational program explored club governance and effective leadership strategies, employee engagement, key performance indicators, capital planning, audit best practices, club management software reengineering/replacement and more. Attendees enjoyed several opportunities for networking with one another and visiting with event sponsors offering the latest products and services relevant to today's club. Those with certification requirements were able to earn up to 12 hours of continuing education by attending education sessions.The feedback from this year's attendees has been very positive. See what they have had to say:"This was one of the best conferences I have attended. Having all of the sessions focused on clubs ensured that the topics would be relevant to me. 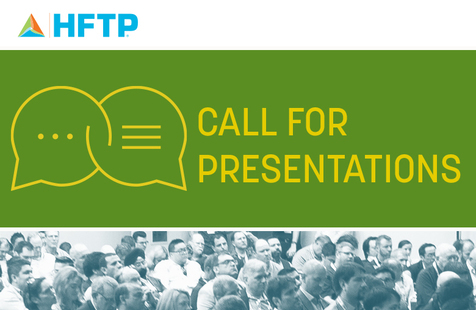 ""If you have a question or a problem in your career at a club, bring it to HFTP's Club Summit. There will be someone there that has faced it and can offer a solution. ""I think the one-on-one [interaction] is crucial, especially if you do not have that locally. ""Club Summit is a tightly-focused educational program that delivered 100 percent relevant material and brought together colleagues in a setting that maximized the opportunity for information-sharing. 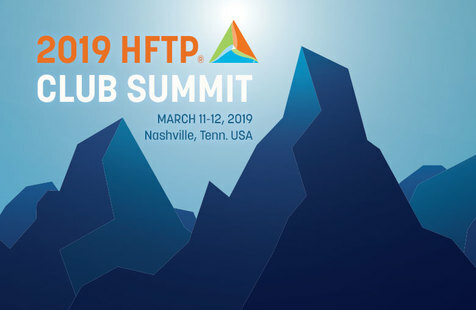 "Learn more about the HFTP Club Summit by visiting www.hftp.org. 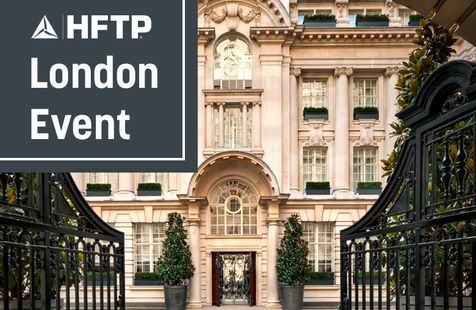 Meet with HFTP representatives and London-area hospitality professionals for an evening of education and networking. Learn about the key benefits that HFTP provides to its members and meet with individuals who have similar professional interests. An educational presentation will be presented as part of the programme.The event will be held at the luxurious Rosewood Hotel London, which is an Edwardian Grade II-listed building that has been sensitively renovated to create a luxury hotel with the ambiance of a stylish London residence.Event Details: When: March 14, 2019 Where: Rosewood Hotel London / Salons 3, 4 and 5 / 252 High Holborn, London Host: Carl Weldon, Chief Operating Officer, HFTP EuropeAgenda: Arrivals and Networking starts at 18:00 Presentation and Information starts at 18:30Event Speakers: Carl Weldon, COO Europe | HFTP Introduction Sarah Duignan, Director of Client Relationships | STR Global A Review of Worldwide, European and U.K. Performance Statistics and Trends Andrew Evans, CEO - Keystep Solutions | Event Sponsor What Roadmap? "Where are the multitude of new ideas and technologies taking hospitality? Are they helping or just overwhelming IT Departments with more and more projects to deliver?" Adam Blake, CEO | ThreatSpike Labs Exploring InfoSec in a Hospitality Environment! "What does this mean?? How we view data security with a fresh pair of eyes! Threat hunting like you've never seen before. "Please RSVP as space is limited.Thank you to the event sponsor: Keystep Solutions and Transputec/ThreatSpike. The following individuals passed the exam for the Certified Hospitality Accountant Executive (CHAE(r)) and the Certified Hospitality Technology Professional (CHTP). Click here to learn more about HFTP's certification programs.New DesigneesNovember 2018:Susan Black, CHAE * Director of Finance * Wyndham Orlando Resort Bonnet Creek * USARobert Krueger, CHAE * Director of Finance * Transition * USADennis Villegas, CHAE * Revenue Audit Manager * Rosen Hotels & Resorts * USAAlicia White, CHAE * Controller * HRT Solutions * USAMax Starkov, CHTP * Founder and Director * HEBS Digital * USADecember 2018:Karim Mahmoud Abdel Halim, CHAE * Financial Controller * Corp Hotel * Saudi ArabiaScott der Boghhossian, CHAE * Supervisor * Condon O'Meara Ginty & Donnelly * USADebbie Formica, CHAE * Assistant Controller * The Club at Mediterra * USAJanuary 2019:Emily Contardi, CHAE * Controller * Spring Lake Golf Club * USAKe (Freemen) Deng, CHAE * Director of Operations * Jinmao Hotel * ChinaIndika Ranasinghe, CHAE * Financial Controller * Sunny Hospitality Management * USAChristopher Skaggs, CHAE * Assistant Controller * Hotel Valley Ho * USARunhong (Renee) Zhang, CHAE * Director of Finance * Jinmao Hotel Management * ChinaFebruary 2019:Angela Lee, CHAE * Accounting Manager * Terranea Resort * USAWhy Get Certified?Elevate your professionalism and demonstrate superior industry performance. Active certificants have reported higher salaries and various career advancement opportunities. Becoming certified indicates that you are committed to professionalism, continuing education and your chosen career path. HFTP offers the only designations for finance and technology professionals who are working in the hospitality industry. How HFTP Certification Can Advance Your Career>Certification Advisory Program (CAP)HFTP launched the Certification Advisory Program (CAP) to assist CHAE and CHTP certification applicants in achieving their HFTP certification designation. The program brings together both candidates and advisors, who will help and support candidates in one-to-one interactions, as a supplemental review option for the certification exams. Learn More>About HFTP CertificationsHFTP administers the examination and awards the certification for the Certified Hospitality Accountant Executive (CHAE) and the Certified Hospitality Technology Professional (CHTP) designations. HFTP's certification programs are globally recognized for setting industry standards for hospitality finance and technology. Qualification for the exams is based on level of education and experience in the industry. Student programs are also available. Find out how to apply as well as exam information, study guides, check lists and much more by visiting HFTP's website at www.hftp.org (click "Career Development" at the top).Questions?For questions or more information on HFTP's certification programs, contact HFTP Certification Manager Robin Bogdon at robin.bogdon@hftp.org or +1 (512) 220-4021. 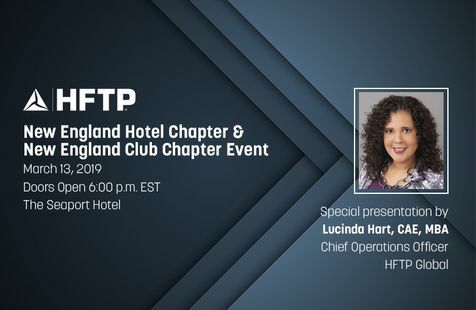 Later this month, the HFTP New England Hotel and New England Club chapters will host an event to network with HFTP members and hospitality professionals.HFTP Global Chief Operations Officer Lucinda Hart, CAE, MBA will present the HFTP Global Update. All area HFTP members are invited to attend, learn what is happening around the world with HFTP, the future direction of HFTP and what value the association brings to members. March 13, 2019 Begins 6:00 p.m. EST6:45 p.m. program start, 7:30 p.m. dinner Location: The Seaport HotelOne Seaport Lane, Boston, MA 02210To attend, please send your RSVP. 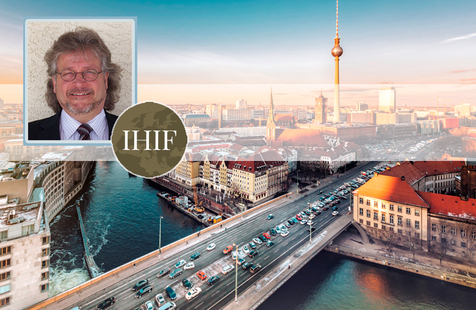 HFTP Past President Ralph R. Miller CPA, CA, CBV, CHA, CHAE, president of Inntegrated Hospitality Management will be presenting an Asset Management Master Class at the International Hotel Investment Forum 2019 in Berlin. Representing HFTP, Miller will lead the session, "Convergence of Accounting Principles & Operations Reporting; Implications/Benefits for Asset Managers," which runs from 2:00 - 2:50 p.m. on March 5. In the presentation he will discuss the Uniform System of Accounts for the Lodging Industry, 11th Revised edition. Miller is a member of the AH&LA Financial Management Committee, which oversees the revisions of the reference book, making him well-versed on the guidance within the USALI.The IHIF 2019 conference program will look at new growth strategies for all stakeholders, whether they are to be found in traditional markets, emerging destinations, improved asset management or operational strategies, or alternative lodging concepts. Over three days, the event will bring together over 2,300 leaders of hospitality investment from 80 countries to share their expertise, meet new partners and make deals. It runs from March 4-6 in Berlin, Germany. 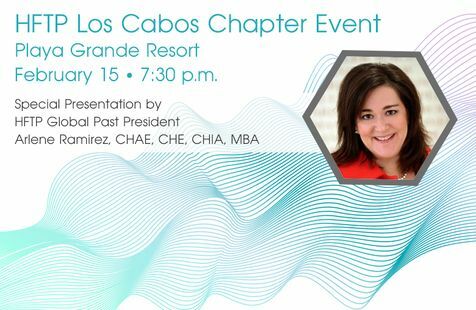 This month, the HFTP Los Cabos Chapter will have a special guest speaker: HFTP Global Past President Arlene Ramirez, CHAE, CHE, CHIA, MBA. 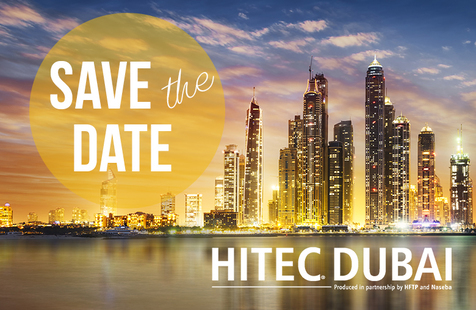 Ramirez will be presenting an update on HFTP Global initiatives. She will cover what HFTP is doing around the world with HFTP, the future direction of HFTP and what value the association brings to members.All area members are invited to attend. Here are the details:Friday, February 15, 2019 | 7:30 p.m. Playa Grande ResortAv. Playa Grande no. 1 Col. CentroCabo San Lucas, BCS, Mexico, 23450Meeting Room: AuditorioTo attend, send an RSVP. 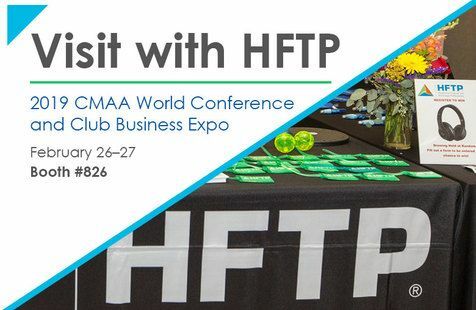 HFTP will be at the upcoming 2019 CMAA World Conference and Club Business Expo on February 24-28, 2019 in Nashville, Tennessee USA. The event offers a robust educational programming with sessions on hiring, marketing, food and beverage, finance, member relations and more.Come by HFTP's booth #826 at the Club Business Expo and visit with HFTP Global representatives to discuss your career needs or those of your staff and how HFTP membership can help. HFTP and UPS took the guesswork out, and put the easy in. 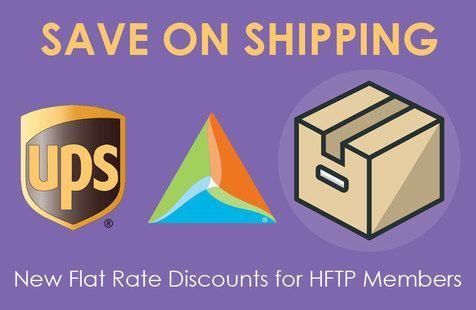 HFTP members now have access to new and improved flat rate pricing with UPS -- no matter how much you ship, when you ship, or where it's going.Members-Only Savings Include:10% on UPS Next Day Air(r) Early45% on Domestic Next Day / Deferred25% on Ground Commercial / ResidentialInternational: 50% on Export / 40% on Import / 25% Canada StandardSavings begin at 75%* on UPS Freight(r) shipments over 150 lbs.In addition, members can take advantage of UPS Smart Pickup(r) service for free.Open a new account, or if you are already taking advantage of the UPS savings program, re-enroll and apply the new discounts to your existing account by visiting: www.savewithups.com/hftp or call 1-800-MEMBERS (1-800-636-2377), M-F 8 a.m. - 5 p.m., ET.Visit www.savewithups.com/hftp for specific services and discounts. 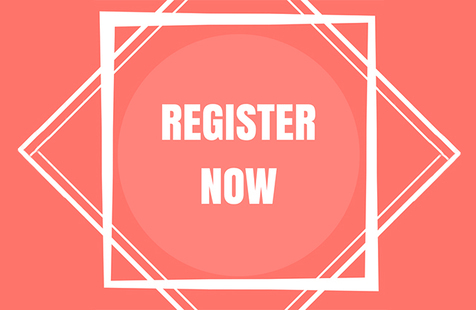 HFTP Mid-south Atlantic Regional Conference / February 14-16, 2019Bring a guest and join HFTP for the 13th Annual Mid-south Atlantic Regional Conference (MSARC) located at The Williamsburg Lodge in Colonial Williamsburg, Virginia USA. A joint effort by the HFTP Chapters in North and South Carolina and Virginia, the Mid-South Atlantic Regional Conference is held in an effort to bring together all the HFTP professionals in the region for continuing professional education with time for socializing and getting to know each other better. The MSARC is a hit with attendees because of the affordable cost and intimate nature of the conference. The MSARC committees have done an excellent job through the years of providing excellent value for the investment. The event has become large enough to provide excellent educational opportunities, but still remains small enough to avoid the larger convention hotels. Attend to find out for yourself how walking into a room where "everybody knows your name" is so much better than being just another face in the crowd.Get a first-hand account of the event by reading a dispatch from the 2017 MSARC written by HFTP Global Treasurer Marke Pate Sr., CHAE, CHTP, MBA.View the event schedule here.Hotel Information:The Williamsburg Lodge310 South England St.Williamsburg, VA 23185Registration:Early Bird Member Rate (Before January 1, 2019) = $200.00 USDEarly Bird Non-Member Rate (Before January 1, 2019) = $225.00 USDMember Rate (Prior to February 1, 2019): $225Non-Member Rate (Prior to February 1, 2019): $250Student Rate = $100.00 USDRegister Now>Friday Reception Dinner: Attendees are welcome to bring guests. Reception dinner price for guests is $125 USD per person. Guests are invited to attend the conference as well. Full Conference fee applies for guests. The HFTP network has just expanded with two new Canadian-based student chapters at Seneca and Niagara Colleges, and one U.S.-based student chapter at Johnson & Wales University. The new chapters add 109 HFTP members. 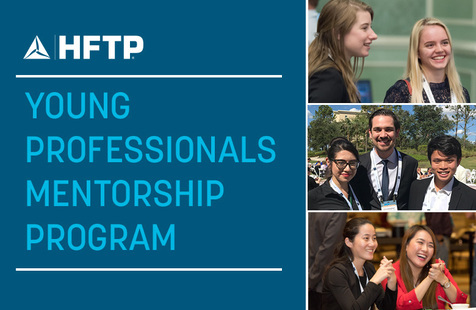 HFTP has seen a significant growth in its student membership count this year, resulting in five new student chapters in the 2018 calendar year. 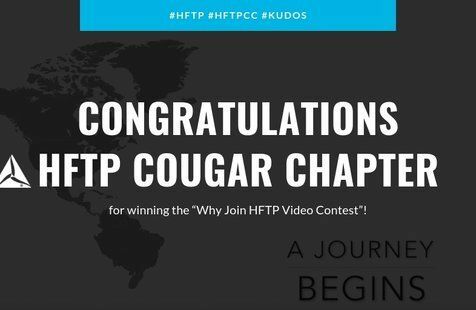 The other new chapters that have joined HFTP this year are at New York University and Kansas State University.The three newest student chapters include:HFTP Seneca CollegeChartered: November 27, 2018Faculty Advisor: Prof. Angelina MalikChapter President: Morniysha AnnestineThe chapter has 64 members. (62 student members, 2 faculty)HFTP Johnson & Wales UniversityFaculty Advisor: Prof. Robert WahlChapter President: Joseph SpinelliThe chapter has 14 members (12 students, 2 faculty)HFTP Niagara College (Canada)Chartered: December 6, 2018Faculty Advisor: Prof. Paul WillieChapter President: Anna CherdakovaThe chapter has 31 members (29 students, 2 faculty)Anna Cherdakova, the HFTP Niagara College president, said about the new chapter, "Many thanks to our faculty advisors at Niagara College and members of HFTP, without whom this would not have been possible." See the VideoWonderful job Cougars! Recently HFTP held its Annual Business Meeting at the 2018 HFTP Annual Convention at the Omni Louisville Hotel in Louisville, Kentucky USA. The meeting was led by 2017-2018 HFTP Global President Timothy Nauss, CHAE on Friday, October 26. The following are the minutes from that meeting, detailing the association's achievements of the past year, and what the association is planning for the coming year. 2018 HFTP Annual Business Meeting MinutesOmni Louisville Hotel - President Timothy G. Nauss, CHAE welcomed the members in attendance and called the Annual Business Meeting to order on October 26, 2018 at 9:16 a.m. Eastern Time.President Timothy Nauss, CHAE introduced the 2017-2018 Executive Committee and Board of Directors. President Timothy G. Nauss, CHAE, recognized the directors who completed their terms in 2018 and thanked them for their service. Outgoing plaques were presented to: Director Cindy Estis Green, Director Sherry Marek, Director Kaeko Shirasu-Bailey and Executive Advisor Jill Burnett, CHAE, CPA.HFTP CEO Frank Wolfe, CAE, gave tribute to Immediate Past President Lyle Worthington, CHTP. 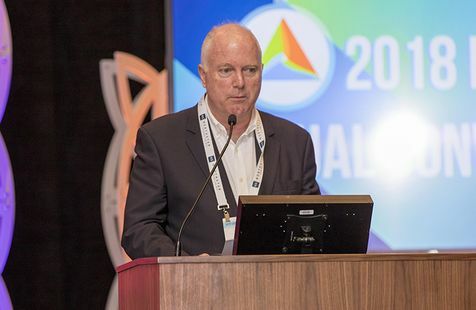 Wolfe highlighted that during Worthington's term as Global President, he was a disrupter and was instrumental in lending his expertise to assist HFTP in developing the Entrepreneur20X competition. Wolfe noted that under Worthington's leadership, HFTP expanded the HITEC brand internationally. Wolfe also noted that Worthington was instrumental in setting the stage for young professionals to get involved in HFTP. Wolfe presented Worthington with a plaque honoring his service and dedication to HFTP.HFTP Global Secretary, Mark Pate Sr., CHAE, CHTP, MBA, announced the minutes for the 2017 Annual Business Meeting held in Orlando, Florida, USA. Pate referred members to the 2017 Annual Convention Meeting Minutes that were posted on HFTP News and called a motion to approve. A motion was made, seconded and carried to approve the 2017 Annual Business Meeting minutes as presented.Treasurer's Report:Treasurer Michael Levie, CHTP, delivered the Treasurer's Report for the fiscal year that ends October 31, 2018. Levie informed the members to the anticipated operational revenue for the fiscal year ending October 31, 2018, will be approximately $8.44 million and operational expenses of approximately $8.81 million. Levie, commented on predicted realized gain of $140,000 and unrealized loss on investments of $10,000 resulting in a Net Expense of approximately $240, 000 for the year.Levie informed members that the HFTP Global Board of Directors approved the 2018-2019 operational revenues of approximately $8.97 million and operational expenses of approximately $9.25 million, for a net expense of approximately $280,000. Levie also informed the members that it has become necessary for HFTP to increase its annual membership dues to $415. Levie noted that this has been the first increase since 2013.Strategic Plan:Vice President Scot Campbell, CHTP, mentioned some of HFTP's initiatives for 2019 including that HFTP will maintain the premier conferences next year, including HITEC Europe in Mallorca, HITEC North America in Minneapolis and HITEC Dubai; the CIO/CFO Events with HITEC Europe, two Entrepreneur20x competitions; the Annual Convention; the Club Summit; Club & Hotel Controllers Conference; the Club Forum; and the Hotel Financial Executive Exchange. Campbell noted that in addition, the Chapter Leadership Summit will return to the schedule as a bi-annual event. Campbell highlighted that HFTP's online education will continue with a strong line-up of ProLinks webinars with monthly offerings.Campbell also informed members that HFTP Global will continue to provide important, custom content and research reports through its news sites: HFTP News, HITEC Bytes, Club Bytes, Finance Bytes, F&B Bytes and GDPR Bytes; as well as regularly published insight on the HFTP Connect blog.President's Report:President Timothy Nauss, CHAE started his report thanking his fellow HFTP Global Executive Committee members for their guidance, dedication and efforts. He also thanked HFTP members, the 2017-2018 Global Board of Directors, and HFTP CEO Wolfe and his staff for their support during his term as HFTP President.Nauss spoke about his trajectory during his term and highlighted some accomplishments, including: HFTP's commitment to cybersecurity research and its swift, prolific response to GDPR enacted in May. Nauss mentioned the vigorous commitment to scholarships for students in hospitality. Another achievement was the proactive campaign to engage young hospitality professionals at major events like HITEC and Annual Convention through specially-designed council work.Chief Executive Officer Report:HFTP CEO Frank Wolfe, CAE thanked the Annual Convention attendees and took a moment to recognize the HFTP Global staff for their hard work and dedication. Wolfe gave his report on the success of the association over the past year, and recognized and thanked Nauss for his services to HFTP.Wolfe announced the achievement that HFTP purchased the intellectual rights for the Uniform System of Accounts for the Lodging Industry (USALI). Wolfe announced the redesign of PineappleSearch.com and highlighted the following: the results of the Forrester Report, the USFRC publication, the IHG Partnership, the HFTP Chapter funds increase and the certification programs. Wolfe discussed future reports, research, advisory councils and various task forces.Wolfe concluded his report by thanking HFTP members and recognized the hard work of the 2017-2018 HFTP Global Board of Directors.Nominating Committee Report:Immediate Past President Lyle Worthington, CHTP discussed the Nominating Committee process. Worthington noted that the Nominating Committee met May 2018 in Dallas, Texas, USA. Worthington encouraged members to apply.Worthington called upon Secretary Mark Pate Sr., CHAE, CHTP, MBA to elect the 2018-2019 Board of Directors and the Executive Committee.In accordance with Article X, Section 3, of the HFTP bylaws, Pate cast the single ballot for the 2018-2019 slate of directors, and declared the individuals mentioned below as duly elected. The uncontested slate of Board of Directors includes:Toni BauCarson Booth, CHTPJill Burnett, CHAE, CPAMark FancourtIn accordance with Article X, Section 3, of the HFTP bylaws, Pate cast the single ballot for the 2018-2019 slate of officers, and declared the following individuals as duly elected to the HFTP Executive Committee:President Scot Campbell, CHTPVice President Michael Levie, CHTP Treasurer Mark Pate Sr., CHAE, CHTP, MBASecretary Neil Foster, CHTP, MBAImmediate Past President Timothy G. Nauss, CHAEExecutive Advisor, Stephanie Anderson, CHAE, CPA, CGMAPate informed the members that the Executive Committee would be installed later that night at the HFTP Annual Tribute to Success.Adjourn:There being no further business, a motion was made, seconded, and carried to adjourn the meeting at 9:50 a.m. The following individuals recently passed their respective exams for the Certified Hospitality Accountant Executive (CHAE) and Certified Hospitality Technology Professional (CHTP). Click here to learn more about HFTP's certification programs.New DesigneesKrysta Erovick, CPA, CHAE / vice president of finance / Discover Lodging Management / USAMatthew Rosado, CHAE / director of finance / Doubletree Minneapolois Park Place / Greenwood Hospitality / USAKristin Gassick, CHTP / Corporate Director of IT / Enchantment Group - Resorts & Spas / USAGabriel Longoria, CHTP / IT Manager / Hotel Emma / USAWhy Get Certified?Elevate your professionalism and demonstrate superior industry performance. Active certificants have reported higher salaries and various career advancement opportunities. Becoming certified indicates that you are committed to professionalism, continuing education and your chosen career path. HFTP offers the only designations for finance and technology professionals who are working in the hospitality industry. How HFTP Certification Can Advance Your Career>Certification Advisory Program (CAP)The program is designed to assist CHAE and CHTP certification applicants in achieving their HFTP certification designation. CAP brings together both candidates and advisors, who will help and support candidates in one-to-one interactions, as a supplemental review option for the certification exams. Learn More>About HFTP CertificationsHFTP administers the examination and awards the certification for the Certified Hospitality Accountant Executive (CHAE) and the Certified Hospitality Technology Professional (CHTP) designations. HFTP's certification programs are globally recognized for setting industry standards for hospitality finance and technology. Qualification for the exams is based on level of education and experience in the industry. Student programs are also available. 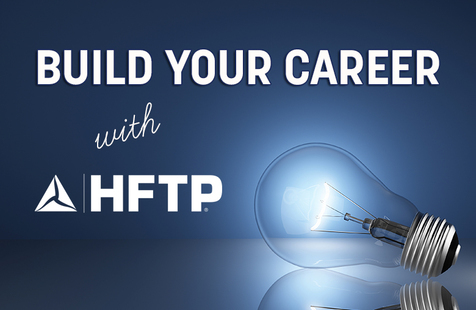 Find out how to apply as well as exam information, study guides, check lists and much more by visiting HFTP's website at www.hftp.org (click "Career Development" at the top). To subscribe to the HFTP News Newsletter please enter your contact details below. I do want to receive the HFTP News email newsletter.